This lovely property for sale is located on the fantastic and exclusive Mount Argentario, with a panoramic view over the clear blue sea. The main villa is spread over several levels and has a total surface area of around 300 sqm; there is also an outbuilding dedicated to guests or staff. On the ground floor, there is the living area, which includes a large, bright living room with big windows overlooking the terrace, from which you can enjoy the surrounding landscape. On this floor, there is also a big kitchen leading to the garden, a dining room, and a bathroom. On the upper floor, there is the sleeping area, which is home to four bedrooms and four bathrooms. This dream home is completely surrounded by a magnificent, 3,300 m2 terraced garden finely planted with typically Mediterranean plants. It winds through typical walkways, paths, and stone steps. In fact, there is a staircase leading to the lower part of the garden, where a luxurious and large panoramic swimming pool has been installed. The villa also features an underground garage. The private setting in direct contact with nature where this magnificent property is located in a perfect solution for those who wish to live in a calm place but also close to the services and comforts offered by the town's centre and its surrounding cities. Mount Argentario, an exclusive and renowned resort area on the Tuscan coast is characterized by mountainous lands and a high rocky coast and it is covered by dense and lush vegetation: dwarf palms, Mediterranean shrubs, olive trees, vines, and fruit trees. Destination of elite tourism since the time of the Etruscans and Romans, Mount Argentario today boasts wonderful luxury villas and prestigious properties that are set like precious gems in dream locations. 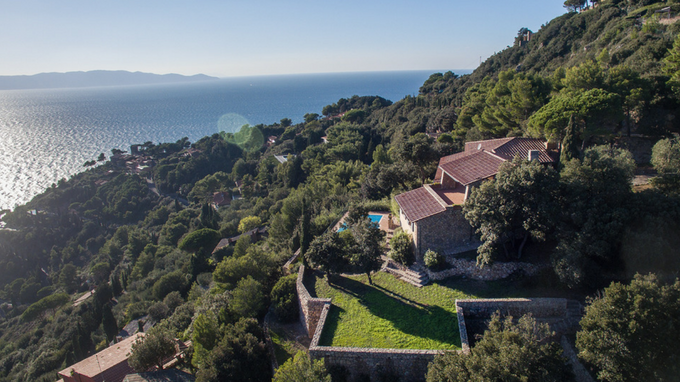 With its crystal clear sea, lush vegetation and relaxation areas, the Argentario is an increasingly popular and attractive destination for both the national and international elite, perfect for hosting fabulous estates. Surrounded by the green hills around Siena there is this hotel for sale, featuring a swimming pool and a wonderful panoramic view. This stunning early 20th-century villa for sale is just a short walk from Porta Romana, in Florence. Mediterranean style Luxury Villa For Sale on the Tuscan Coast. Villa, surrounded by vegetation. It offers many amenities including Swimming Pool, Outdoor Jacuzzi and Panoramic Terraces. This stunning luxury villa with a charming view of the sea is currently for sale in one of Anacapri's most enchanting areas.